Here you will find the pefect carbid grade for each application. We produce the best possible metallurgical basics for the production of precision cutting tools and. Take advantage of the expertise of our team of experts in selecting the perfect carbide grade for your requirements. 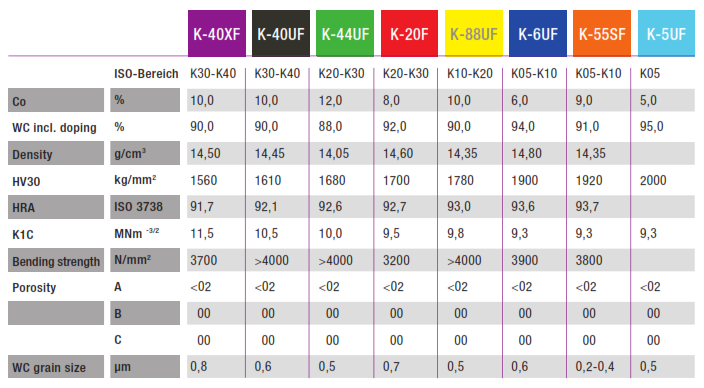 K-40XF (DIN) For tough work piece materials in the hardness range <45HRC e.g. stainless and carbon steels, titanium- and nickel alloys. For low cutting speeds, high feed rates and interrupt cutting. K-40UF (DIN) For either tough work piece materials, titanium and heat-resistant alloys, austentic stainless steels, grey cast iron. K-44UF (DIN) Particularly suitable for: titanium and nickel based alloys, high alloyed steels, grey cast iron, composite materials. For high-speed cutting. K-20F (DIN) Grey cast and chilled cast iron, hardened steels, aluminium alloys. K-88UF (DIN) For end milling applications in hard materials (45-70HRC) e.g. fully hardened and tempered steels, hard cast materials, tempered alloys. K-6UF (DIN) Composite materials (e.g. CFRP), graphite, hardened steels, grey cast iron. K-55SF (DIN) For highly wear-resistant materials, e.g. hardened steels, graphite, aluminium alloys, composite materials like Kevlar and CFRP. For high-speed cutting and for dry cutting. K-5UF (DIN) Composite materials (e.g. CFRP), graphite, fully hardened steels, grey cast iron. HHT-Hartmetall offers for each application the optimal carbide in the best quality. We carry hard metal blanks as standard in different alloys and have an extensive range of carbide resistant stock. Grey cast, hard cast, tempered steel, hardenable aluminium alloys, plastics with filling materials, fibreglass-reinforced plastic and brake shoe linings. Titanium alloys, heat-proof alloys, austenitic stainless steels, grey cast iron, fibreglass-reinforced plastics. Titanium alloys, heat-proof alloys, stainless steels, tempered steels, grey cast iron, fibreglass-reinforced plastics. High-wear-free materials, stainless steels, aluminium alloys, graphite, composite materials such as a Kevlar and fibreglass-reinforced plastic.